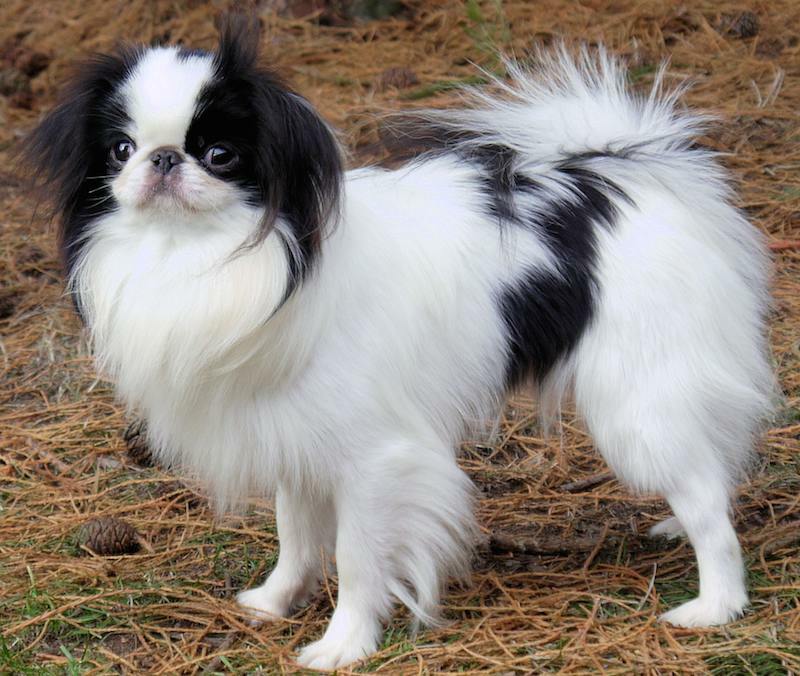 Japanese Chin (also called Japanese Spaniel) as it is known in Japan, shares its ancestry with the Pug and Pekingese. 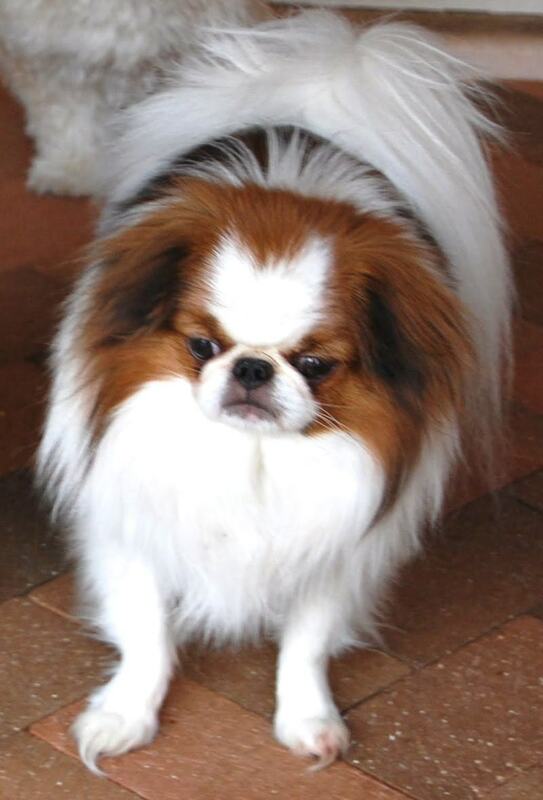 It’s thought the small dogs were brought to Japan around 500 BC as gifts to the Mikado. There, they underwent further development as special pampered pets of the Imperial family and were reputedly given ‘sake,’ a wine made from rice, to stunt their growth. Some were so small they were kept in hanging cages like birds. In 1853, when Commodore Perry was visiting Japan on a trade mission, he was presented with a pair of Japanese Spaniels that he presented to Queen Victoria on his return. The breed was first exhibited under the name Japanese Pug in 1862 and soon found its way into public favour. 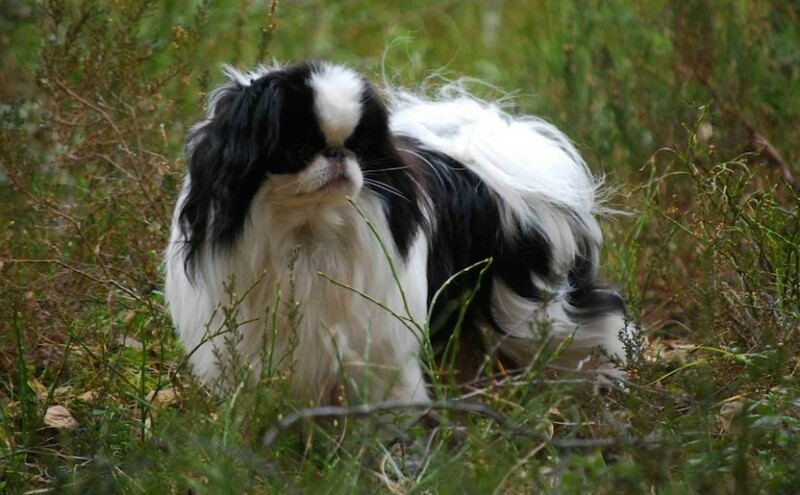 General Appearance: That of a lively, high-bred little dog with smart, dainty appearance, compact carriage and profuse coat. Size: In size they vary considerably, but the smaller they are the better, provided type and quality are not sacrificed. When divided by weight, classes should be under and over 7 lb. (3 kg). Coat and Colour: Coat profuse, long, straight, rather silky. 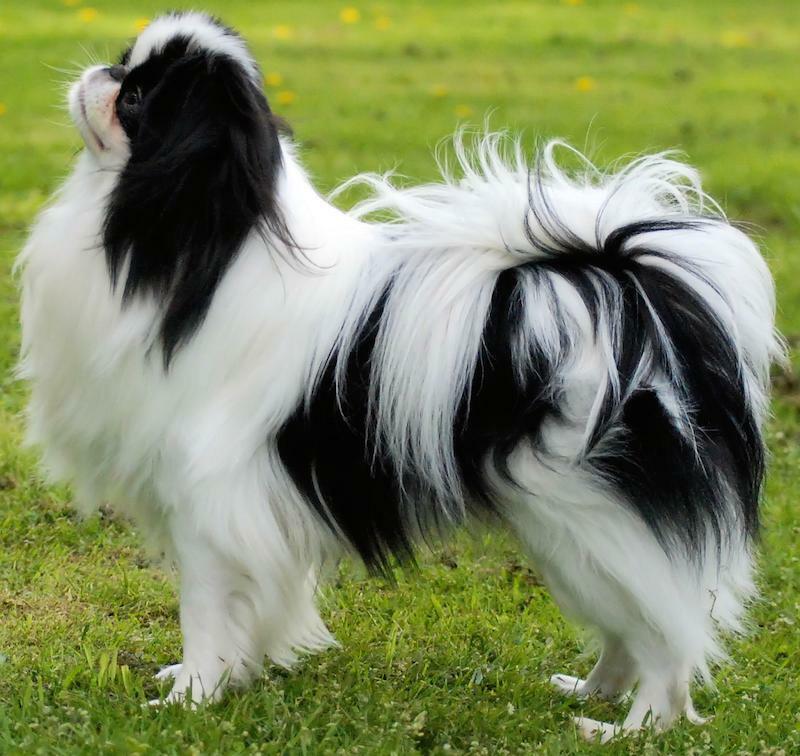 It should be absolutely free from wave or curl, and not lie too flat, but have a tendency to stand out, especially at the neck, so as to give a thick mane or ruff, which with profuse feathering on thighs and tail gives a very showy appearance. The dogs should be either black and white or red and white, i.e., particoloured. The term red includes all shades of sable, brindle, lemon and orange, but the brighter and clearer the red the better. The white should be clear white, and the colour, whether black or red, should be evenly distributed patches over the body, cheek, and ears. Head: Should be large for the size of the dog, with broad skull, rounded in front. Nose very short in the muzzle part. The end or nose proper should be wide, with open nostrils, and must be the colour of the dog’s markings, i.e., black in black-marked dogs, and red or deep flesh colour in red or lemon-marked dogs. 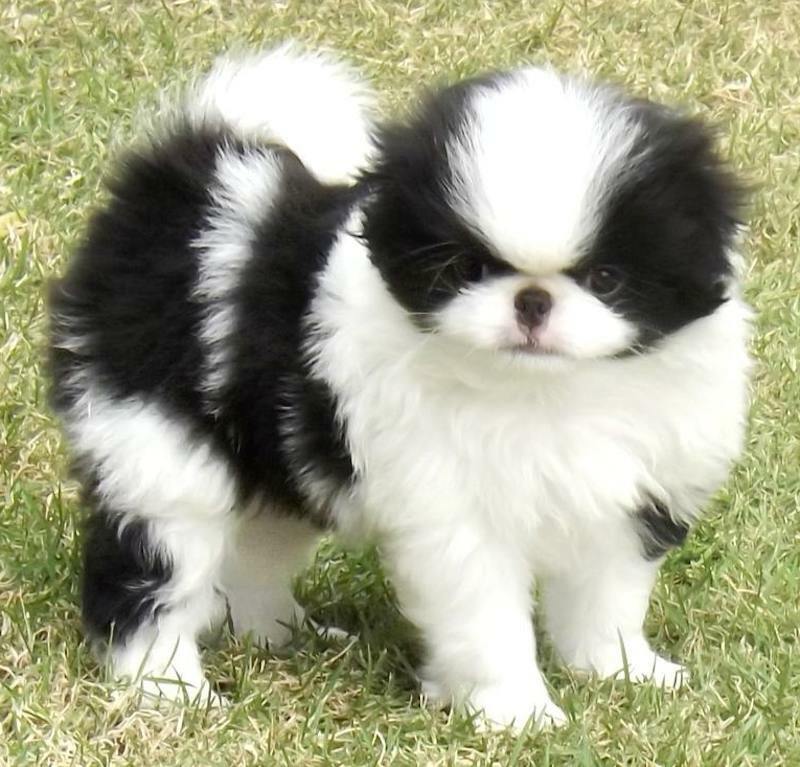 It shall be a disqualification for a black and white Japanese Spaniel to have a nose any other colour than black. Eyes large, dark, lustrous, rather prominent and set wide apart. Ears small and V-shaped, nicely feathered, set wide apart and high on the head and carried slightly forward. Body: Should be squarely and compactly built, wide in chest, cobby in shape. The length of the dog’s body should be about its height. Tail: Must be well twisted to either right or left from root and carried up over back and flow on opposite side; it should be profusely covered with long hair (ring tails not desirable). Gait: These dogs should be essentially stylish in movement, lifting the feet high when in action, carrying the tail (which is heavily feathered, proudly curved or plumed) over the back. Disqualifications: In black and whites, a nose any other colour than black.